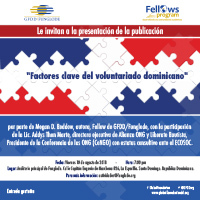 The Global Foundation for Democracy and Development (Funglode), along with Funglode – its sister organization in the Dominican Republic – and its Fellows Program, cordially invite the general public to the presentation of the publication ‘Fundamentals of the Dominican Voluntary Sector”, written by Megan D. Beddow. Beddow did her research on the Dominican voluntary sector when she participated in the GFDD/Funglode Fellows Program, during May-July 2015. She will present the results of her research on Friday, August 10, at 7:00 p.m., in Funglode’s Auditorium. The event, which will be open to the public, will also include Severin Carminati, Program Officer of the civil society organization “Alianza ONG” and Liberato Bautista, president of the Conference of NGOs (CoNGO), an accredited NGO with Consultative Status before the U.N. Economic and Social Council (ECOSOC). In her study, the author analyzes the opportunities and challenges associates with the work of volunteers in the Dominican Republic. It looks into the external factors and highlights the organizational characteristics of the sector. The publication is part of GFDD and Funglode’s Series on Studies and Reflections, which provides research results, academic articles and speeches related to important items on the international agenda from the local, regional and global perspective.